The Continuous Synopsis Record (CSR) provides the history of a ship from its initial commissioning to its final decommissioning. It records ship related data such as name, owner, bareboat charterer and changes thereof to make them traceable. On board of any ship engaged on international voyages and subject to part A of chapter I of the SOLAS convention the original of the Continuous Synopsis Record must be kept and made available for inspection at all times. Sanctions may be imposed on ships not meeting this obligation. The CSR will be re-issued upon any change of its content or of the ship’s flag within three months from the date of the change. the content of the CSR is changed. Copies of all previously issued CSRs for the ship, including the closing-CSR of the former flag. 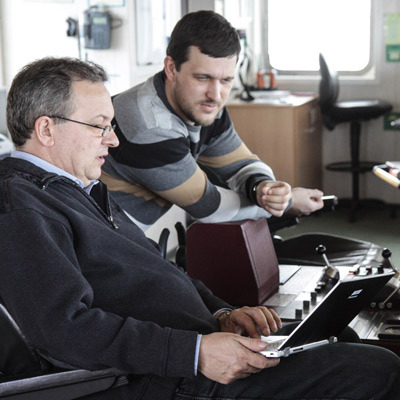 Amendments to the CSR, made by the ship’s master or company to reflect changes of e.g. the ship’s flag, name, port of registry, owner and company (ISM) must be documented in an amendment sheet. This amendment sheet is part of the CSR documents and the administration must be informed accordingly. Any changes must be reflected in an amendment sheet signed by the master or the company. This amendment sheet provisionally replaces the original CSR until this is re-issued within a maximum period of three months. The BSH strongly recommends to keep the amendment sheets permanently on board of the ship for possible inspections. Please note also the requirements of the law of the flag and the notice regarding company- and registered owners identity numbers further below. The ISPS requirements apply, inter alia, to cargo ships of 500 GT and above and to passenger ships regardless of size, engaged on international voyages. These ships must carry an International Ship Security Certificate (ISSC) by which the flag state administration confirms that the security system has been verified, the ship complies with all requirements and a ship security plan (SSP), approved by the flag state administration, is available. The ISSC must be presented regularly at inspections of the ship in ports. A missing or expired certificate may imply heavy sanctions. a Recognized Security Organisation, (RSO), recognized by the BSH, has carried out an initial verification of compliance with all relevant requirements. Therefore, an interim-ISSC is issued for newbuildings and for ships changing flag. The interim-ISSC is valid for a maximum period of 6 months and may not be extended! A second interim-ISSC is only issued in exceptional circumstances. proof that the ship safety alert system (SSAS) on board of the ship is operational (report of a test alarm after change of flag). Confirmation by a RSO that an interim verification (pre-audit) has been carried out. The initial-verification on board by the RSO may only be carried out after the ship security plan has been approved and placed on board at least 30 days before. Its purpose is a detailed verification of the entire security system on board of the ship. Upon successful verification the BSH will be directly informed by the RSO and will issue the full-term ISSC for a period of validity of 5 years. To maintain the validity of the certificate over the entire period an intermediate verification has to be carried out by a RSO between the second and the third anniversary date of the certificate. The company identification number has become a mandatory part of the (full-term or interim) International Ship Security Certificate (ISSC). Previously issued certificates remain valid until their expiry or a change to the CSR (whichever comes first). Both identification numbers are unique and may be received free of charge from the website of Lloyd’ s Register – Fairplay Ltd. who are acting on behalf of the IMO. Please check first, if numbers have already been assigned. The identification numbers are to be submitted to the BSH with any application for the issuance of a CSR or an interim ISSC. The responsibilities between a ship and a port facility or another ship have to be established in the Declaration of Security. This holds in particular for a shift in responsibilities, the various security levels and dealings with ships and port facilities that are not bound by the ISPS requirements. At the same time, the requirements of the ISPS-Codes need to be complied with.